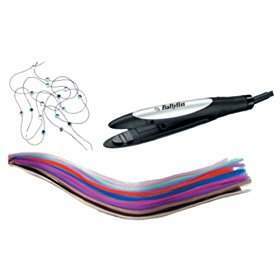 This Babyliss Hair Extension Colourlights Kit would make a funky little prezzy and its just £19.70 delivered from Amazon! Description: Complete salon system for adding high fashion colours to your hair whenever you like. Hair additions have a special waxy adhesive tip that is gently sealed into the hair using a special fixing tool with shaped heating plates.